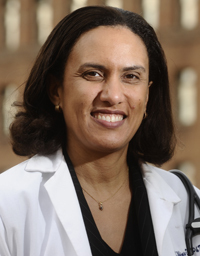 Join us in congratulating one of the Principal Investigators to the San Francisco State BUILD program, Dr. Kirsten Bibbins-Domingo, for this prestigious honor. She has been elected to the National Academy of Medicine (formerly the Institute of Medicine), one of the highest honors in the fields of medicine and health. Dr. Kirsten Bibbins-Domingo is professor of medicine, epidemiology and biostatistics at the University of California San Francisco. She is also the Lee Goldman Endowed Chair in Medicine. Her research focuses on health disparities and the links between social, behavior, biological factors and health outcomes, particularly as they relate to diabetes, chronic kidney disease and cardiovascular disease. She is the director of the UCSF Center for Vulnerable Populations, based at SFGH, and a key leader in UCSF&#39;s CTSI program. She is also Vice Chair of the U.S. Preventive Services Task Force. Click here to visit the National Academy of Medicine website. She is a distinguished academician known for her track record of productivity and impact. Click here to view a 2014 interview with Dr. Bibbins-Domingo regarding the risks of sugar to health. She is also well known for her generous and superb mentorship of many trainees and colleagues. An interview with Dr. Bibbins-Domingo on her work with youth and young adults is also available here. Visit the National Academy of Medicine website for a full list of honorees.